Good Fortune for All spotlights a group of exceptionally rare paintings depicting a late Ming dynasty (1368-1644) Lantern Festival celebration in the city of Nanjing. The Lantern Festival concludes the fortnight of New Year celebrations in China, with the intent of bringing good fortune to all, and is still celebrated today. 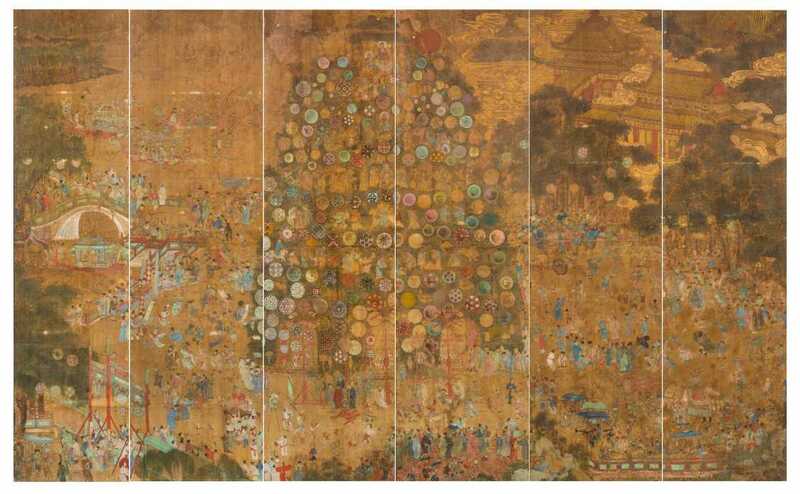 Countless figures in the six paintings, including immortals, soldiers, children, acrobats, musicians, and court officials, are shown engaged in various aspects of the festivities. The paintings were acquired in 2015 and will be on view for the first time in the Niblack Gallery after extensive restoration. Viewers will have the opportunity to further examine the intricate details of these two-foot-wide and eight-foot-high panels with digital images provided on a tablet, as well as enhanced details of a related handscroll titled Colourful Lanterns at Shangyuan (now in a private collection in Taiwan). A pendant installation Qing Imperial Silk Velvet in the Davis Gallery echoes the sentiment of wishing good fortune to all. The installation presents a duo of panels from an eight-panel silk velvet Qianlong imperial congratulatory screen that represents the emperor’s fascination with foreign luxury goods. Collectively, the symbolism of the trees and plants seen in the panels send good wishes to the original recipient as well as the viewer. The panels will be shown in rotation from February 9, 2019 to January 28, 2020. These installations are curated by Laurie Barnes, Elizabeth B. McGraw Curator of Chinese Art. Organized by the Norton Museum of Art. This exhibition was made possible by the generosity of John and Heidi Niblack.